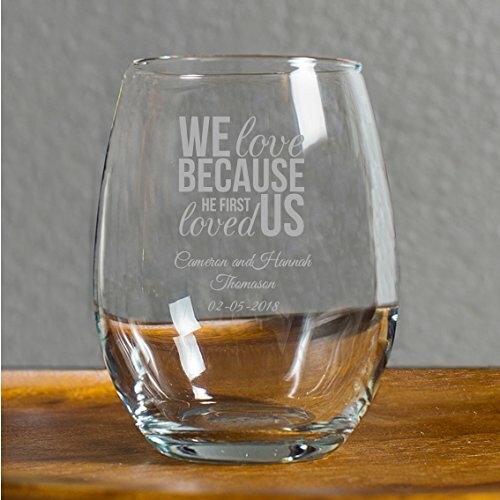 While planning a special day, this is a wineglass that will start the conversation. With brilliance, one can enjoy a Malbec or a savory Syrah, giving room to appreciate color and character. Designed with an ergonomic shape, the curved bowl fits in your hand easily, allowing you to hold it and appreciate the wine that is both modern and vintage. The 9 oz stemless drinking glass appeals to the collection in any bar, hotel lounge or banquet hall. Reading "We Love Because He First Loved Us", the words are arranged to create a square shape within the composition. Fine, sharp line work offers a crisp appearance, our excellence unmatched. With close family, give them glassware that is as classy as they deserve. You have chosen our 72 pack of stemless wine glasses, which will all feature identical text printed with what you specify in Amazon's handy Customizer. Each one holds up to 9 ounces of liquid, standing 4 inches tall - Manufactured and printed in the USA. GIFTING THE GROOMSMAN - Celebrate before, during and after your best friend or family member's wedding. No time like the present. ENHANCE AND PERSONALIZE - This stemless wine glass could use a special touch. Commemorate a special event and celebrate the day. STEMLESS TO SUIT - Your wine will remain at a constant temperature, but the flat bottom increases stability. PACKED WITH CARE, FAST SHIPPING - This stemless glass is individually packed, ready to present (or pay it forward). With us, expect quick turnaround and reliable service to your front door.